This rocky, mountainous island, north west of Rhodes, is one of the most beautiful of the Dodecanese. Here, mast of the inhabitants live off sponge diving. The main part is Aigialos. Other interesting villages include Nimborios, Marthoundas, Pedi and Panormos. Enjoy swimming in the clear waters of Symi, but don't forget to taste the excellent wine, honey, almonds and olives produced here. We first meet the island as we enter the picturesque natural port of Aigialos. It is enchanting to walk through the narrow lanes of this town, which is about 15 minutes walking distance from Ano Symi, capital of the island. As we walk we shall encounter the church of Virgin Mary, the main church on the island. The people of Symi mainly fish and collect sponges. Seskli and Nimos are barren nearby islands ideal for fishing. Symi (or Simi) was reputed to be the birthplace of The Three Graces. 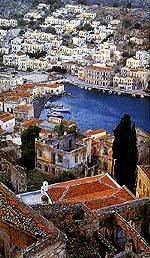 The capital in the north of the island bears the same name and is divided into the upper and lower town, Ano Symi and Kato Poli. The two districts are linked by a lane so steep it has steps. It is flanked by charming neoclassical houses, some of them painted in warm pastel colours, with balconies and peaked, red tile roofs. Many of them also are embellished with neoclassical features on the doors and windows. Their interiors are decorated with wood carvings, the locals having been adept at the craft for generations. The traditional village of Emborios is Symi's second port. The ancient town of Metapontis was situated close by. One of the island's most famous landmarks is the monastery of the Archangel Michael Panormitis on the southwest coast. Built in the early 18th century, it overlooks the bay bearing its name in a setting combining mountain and sea. It contains marvelous Byzantine frescoes and an intricately carved iconostasis. The highest point in Ano Symi is capped by the usual castle of the Knights of St. John, whose emblem can be seen above the main portal. There is no lack of wonderful beaches on Symi. You'll find good swimming at Yialos, Pedio, Emborios, Marathounda, Nanou as well as on the nearby islets of Agia Marina and Nimos. Skala – The main harbor of Patmos. There is a quay for mooring onto, but care must be taken when approaching the as there are numerous rocks and islets which are visible by day. The quay offers good provisioning from the meltemi but not from SE Winds. There is water on the quay and fuel is available. There is good provisions and several tavernas. Take a visit to the monastery but women beware to dress appropriately as no shorts or pants are allowed. Ormos Meloyi – This bay is located NE of Skala. There is a taverna ashore. Its quite inviting for a swim. Ormos Grikou - This bay lies 2 miles SE of Skala. There is a jetty on the north side which has depths of 2 meters. This bay is open to SE winds. There is a taverna and a bus to Skala. Ormos Kambos – This bay is located NE of Livadhi. This bay is open to the S and SE. There is a taverna and mini market located ashore.